A RECENT BOOK titled The Last Cowboys At The End Of The World is about the Gauchos of the XI Region of Chile. This is Patagonia country and land of the Patagons. In the book the author was drawn here by the opportunity to work in the first fly fishing lodge in the region. In fact, he helped convert an old farm house, and that’s where his story and life was forever changed by the people and the Gaucho’s of southern Patagonia. As Kate and I read this book in advance of our trip to the region, we were captivated by how a simple highway from the north changed lives there forever. For us, the trip was to fish some of the legendary rivers of the region on a fact finding mission, to expand our offerings as fly fishing trip advisors and our own travel business. We arrived in a comfortable 737 Boeing jetliner in early January at an airport in Balmaceda, Chile about 600 miles south of the capital city of Santiago. We were picked up by our host for the trip Sebastian Gallelia of Cincos Rio Lodge. Sebastian was very enthusiastic with our arrival and began tell us it was “beetle” time. We arrived at his lodge after a very beautiful ride thru the Rio Simpson Valley a mere 45 minute drive. After a nap to recover from our long journey we were met by head guide Claudio and we began to discuss the options of our stay. He wanted to make sure we saw all we could in our 2 week stay, and again we were informed us it was “beetle” time. Kate and I are avid streamer anglers, and we were anxious to offer up our streamers to trout that have never seen our patterns. Claudio assured us that our streamers were going to do the trick, but he said, it’s “beetle” time… Okay, okay—what’ so damn important about Beetle time? “Cantaria” (chiasognathus granti) Claudio proclaimed. “It’s the largest beetle in all of Chile and it’s on now!” Claudio went on to say that on many rivers this annual event is nothing short of spectacular, bringing every big brown to the surface to eat this helpless land insect. The Cantaria beetles range in size from approximately 1 ½ inches long to 2 ½ inches in length. The width of the bug is about 5/8 to 1 inch. The males have pinchers almost as long as their bodies used to fend off other males during the mating process. 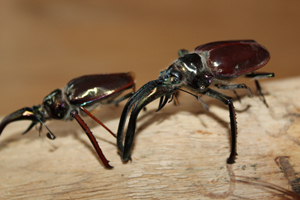 The beetle’s shell is dark brown-to-black and has a green/root beer underbelly. This is one big bug and a pinch from one of the males can make tears come from your eyes! That evening, we talked about the area with Claudio, and met several guests at the lodge from Brazil that were there to fish the many rivers and lakes of this region. They showed us photo after photo of giant browns they had caught in previous days, most on the beetle. The next morning after breakfast, we set out to follow the Simpson River Valley to the Poloma River Valley and fish the Rio Poloma and an adjacent lake. We asked if we could fish streamers and Claudio politely asked we try the beetle. A quick change in fly lines and we were ready to go. We floated along slapping this big bug against the banks, foam lines and any place that looked “trouty.” Whoosh! A nice brown came charging to the surface and took the beetle. That day, many more trout came to the Beetle. When the Cantaria Beetle hits the water it becomes a victim of itself, it can no longer fly and simply flounders on the surface until it drowns. The trout of the Chilean Patagonia have come to know this fate, and to the surface gently and simply to sip in the big bug—like trout feeding on tics. Claudio said that I should twitch the bug for awhile and see if we could get some explosive action. I jumped the beetle pattern like a smallmouth popper. The fly is so big and buoyant that it sounded like a Gurgler as we floated along. Kate suddenly was on to a big fish, and we all laughed at the explosive strike that yielded this trophy of the Rio Poloma. We returned later the same week to this gorgeous river valley to continue our adventures In the Land of the Giant Beetles. To get to Coyhaique, Chile we traveled from Miami to Santiago and then on to our final destination of Balmaceda, Chile. There are a few fly fishing outfitters located in this region, but none better than Sebastian Gallalia’s Cinco Rios Lodge. Our experience was a clean, comfortable lodge overlooking the Simpson Valley, healthy delicious meals and excellent, bilingual guides. Someday, everyone should experience the beetle fishing of Patagonian Chile.